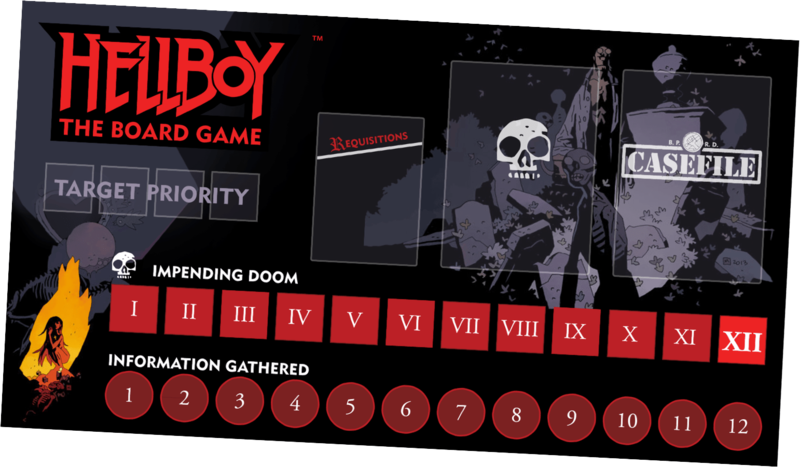 Hellboy: The Board Game – What’s the HQ Board? Hope you’re enjoying Hellboy Week so far. We’ve previously covered the anatomy of an Agent Card and yesterday the delightful James M. Hewitt *swoon* talked about Case Files (with added Skeletor references) on the Needy Cat Games Blog. For today’s blog I’m afraid you’re stuck with me (Rob) but we have got something very exciting to look at: the HQ board, featuring the Impending Doom Track and Information Gathered Track. If you’ve read our previous blog on the early development of Hellboy (which of course you have… there’ll be a test at the end of the week) you’ll know that the game is split into two key elements: combat and investigation. This split between the two parts is represented perfectly by the HQ Board. This large board sits near the game tiles and is used to track a number of different elements. Please note, this is still the work in progress version so the design may change in the finished product. Anyway, what’s it all mean? Not life, just the board. As mentioned in our previous blog about the Agent Cards, during the course of the game enemies will target different agents. Each agent has a token on this track, and it is used in certain situations, mainly when an enemy chooses a target for its attack. Whenever this happens, the agent whose token is at the front of the queue (furthest left) is chosen as the target. If they are not an eligible target, they are ignored and the next agent along is chosen as the target. Whenever an agent is chosen as a target in this way, their token is moved to the far right of the track. The agent in the first space is considered to be the lead agent and gets the final say on what the team should do! If only life were this simple. I might start carrying around my own Target Priority track for meetings. Admittedly this isn’t that thrilling to look at when blank but this is where the Requisition Cards (equipment), Deck of Doom and Case File cards will be placed. It’s likely the Requistion Cards won’t sit here and instead we’ll be adding a discard pile for the Deck of Doom. Anyway, once the game is running, this area will be far more thrilling as you have the suspense of not knowing what’s coming next in the Deck of Doom, while the Case File cards run the mission for you. Hopefully you’ll know all about those after reading James’ blog yesterday. Typically Hellboy stories tend to be a race against time. Hellboy and the team must locate their target before an ancient evil is unleashed or a terrifying ritual is completed. In the game this is represented by the Impending Doom Track. During the course of the game certain events will move the Impending Doom track closer to its inevitable and dramatic conclusion. The track is moved by cards drawn from the Deck of Doom, when the agents take time to rest, if there are too many Frog Swarms on the board, etc. Depending upon the Case File you’re playing there will be different effects if the tracker reaches specific stages of the Impending Doom track. However, the higher it is, the worse things are going to be! On the flip side to the Impending Doom track, you’ve got the Information Gathered scale. This is used to represent how many vital clues the agents have gathered during the course of the mission. You see, scattered throughout the location are clues that could hold an important piece of evidence that exposes a weakness of the final threat. Each time the agents gather one of these clues, the Information Gathered track is moved one or more steps. Just like Impending Doom, the Case Files will dictate what happens when the Information Gathered tracker reaches certain stages. Learning to balance the threat of Impending Doom and taking time to hunt down all the clues to complete the Information Gathered track is a key part of the game and you’ll have to make some tough choices. Well, hope you enjoyed this inspection of the HQ Board. Tomorrow the delectable James M. Hewitt will be back on the Needy Cat Games blog to give you a run down on the ominous DECK OF DOOM (it must be said in a shouty voice). REMEMBER, THE HELLBOY KICKSTARTER LAUNCHES ON APRIL 25th. WE’VE GOT PLENTY MORE PREVIEWS PLANNED ALL THIS WEEK AHEAD OF THE BIG DAY, SO STAY TUNED. The post Hellboy: The Board Game – What’s the HQ Board? appeared first on Mantic Blog. Kore Sci Fi Vehicles - Coming soon!